The A.V. Club: Is being twins a subject you’re tired of talking about? Do you wish you were asked more about your work? Jason Sklar: We would be idiots if we didn’t expect people to talk about it. We obviously are twins and that is a unique thing. There are very few twins who do what we do. But if you watch our comedy or if you follow our career, we try not to make our comedy completely about being twins. We just try to have that be an undercurrent, this interesting symbiotic relationship that just kind of flows together, almost like an oversized extended mind, ping-ponging back and forth between left brain [and] right brain. I think there’s a little bit of wish fulfillment, too. We hear that from a lot of people. Whether they wish they had a twin or not, I think people a lot of times wish they had someone that was on a similar wavelength, and when they see us together, not stepping on each other and listening to each other, and creating something together, people enjoy that. So we’re kind of walking this line between making it something that’s important in what we do but not making that the only focus in what we do. 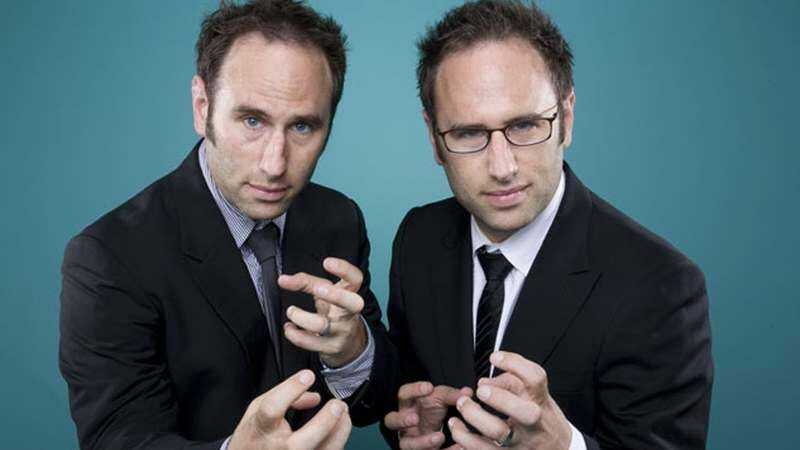 Randy Sklar: We think about our stand-up a lot, and as we start to move toward doing our next special and developing new material, for us, what we’ve really come to is that our stand-up act is gonna be different than anybody who’s doing it, other than other twins who are doing it. I know the Lucas Brothers do it as well. And there’s some similarities. But it’s gonna be different than most everybody else. It’s interesting because we’re trying to figure out what our overall point of view is, and one of the things we do is crack open this relationship and through our material and through the way we interact onstage, give people a glimpse of what that’s like. This is like the relationship between two brothers, and a very unique one. And once we establish that as the underneath part, we can go anywhere in our material. JS: Yeah, I think we want the audience to be like a fly on the wall during us riffing. Like you’re here, you get a chance to see two people who have fun with each other, who are on a similar wavelength, just riffing and having fun. AVC: How much of that is what you’re like offstage? And how much of it was there before you were doing this professionally? RS: I would say that that is the goal, to try and make what we do onstage as close to the way we do things offstage. And it’s similar to the way we riff when we’re among our friends. And we’ve come, at this point in our career, pretty close to getting there. You always can improve. We just did an episode of Playing House with Lennon Parham and Jessica St. Clair, and there are a lot of riff-y moments because they love to improvise, where the four of us were going at it, and to me, that was like it was offstage, [but] onstage. We had just been riffing with them as we were stuffing our faces with craft services 10 minutes before then, and the riffs that we were doing on camera were talking about different things as our characters, but exactly the same as what we were doing off-camera. So that was incredibly satisfying. AVC: The notion of having one voice is unique among brother acts. The Smothers Brothers, for example, had the goofy one and the straight man. Was that always part of the plan to set yourself apart in that way? JS: Yeah. I think from an early point in our comedy career, we were thinking, we don’t want to manufacture personalities. Certainly we don’t want to be tied into characters, like someone’s the funny man, or the dumb one, and someone has to rein that person in constantly. That felt inorganic to who we were. Maybe it’s even the reason we haven’t done more in our career, but we just felt like that we had a chance to do almost a postmodern take on the comedy duo, the comedy team, and I’m glad we did that. Because we’re twins, because we look similar, I think there’s license for us to not force ourselves to be polar opposites, to be a little bit truer to who we are, and it feels more comfortable onstage. AVC: Is it ever a challenge to keep it so consistent and such a single voice? RS: We’re also exploring the idea, the notion that we have different opinions on things, that we can fight. We can argue onstage, as long as that’s organic and the opinions are real. They can be blown-out versions of those opinions for comedic effect, but as long as we disagree about something, we’re okay putting that in there, too, because that, in a sea of two of us together, ends up standing out and being interesting and fun, too. And I think that’s where we’re moving on this next album a little bit, and that may be a theme of it, the sort of cracks in the facade, as it were. But that’s okay, because we’re trying to reflect where we are in our lives, and I feel like we are at similar places in our lives, but there are differences. AVC: How does the writing process work for you guys? Do you sit down and collaborate together? JS: I think it’s a lot like a band. Someone has a riff in their mind, whether it’s just a tiny guitar riff or an idea for a song, and they come in and bring it to the band meeting, and we start jamming and riffing, and seeing all the possibilities of something. The truth is, if it makes us laugh when we’re coming up with it, that usually means it’s going to work. Say Randy had an experience in his life, or an observation he’s made about parenting or the world or whatever, he brings it in, we both start talking about it, riffing on it, seeing what’s funny about it. We get it to a certain point, and then we bring it onstage, and we kind of see where it does well with an audience. If an audience is really giving a lot back to us, that gives us license to riff even more and sometimes we find new moments. We’ve got to do it over and over again to find where we need to stop doing something and where we need to keep pursuing something. I think it was Garry Shandling who once said that years after he wrote something, he finally finished it, because he figured it out years later. That’s always been the way we are with our bits. RS: Patton Oswalt told us—he had just finished a special, and I asked him, “Are you gonna get out onstage and just throw a bunch of stuff out there and start to make that long walk toward that new special?” and he was like, “Nope, I’ve gotta live for the next six months. I’m not gonna do anything, I’m just gonna live my life.” He wasn’t even saying it as advice. He was just explaining it as what he’s gonna do. But I took that as advice. The truth of the matter is, you have to live your life. Being in uncomfortable moments and understanding those, those are the moments that are going to become bits. Something happens in either of our lives, either happens to us together, we both observe it, or individually. Then, onstage, what we started to do more was say, “This happened to me,” and I can be explaining it to both the crowd and to Jason, and Jay’s real reaction to it comes out, and we feel like that’s a way to incorporate Jason into it. That’s what makes it different from one person doing a bit. We want to figure out a way that incorporates both of us in a unique way. AVC: When you were first starting out in high school and college, you were leading similar lives. Has it gotten harder to find that common ground in adulthood? JS: No, I think it’s gotten easier. Because we live different lives outside of our professional lives. We have our own families and our own kids, our own lives that are totally different. It’s like twice the experiences, more experiences to draw from. It’s more stuff. Randy is going next weekend with his wife to see the Grateful Dead with Trey [Anastasio, Phish frontman] as the lead singer. RS: I like the Grateful Dead, I’m not the biggest fan. My wife has seen 165 Dead shows in her life. JS: I’m convinced that something will come out of that experience, whether it’s him trying a drug that he hasn’t for many many years, or experiencing this moment that hearkens back to a moment that we shared when we were younger and went to the Dead. There will be some revelation of truth about where we are in our lives through this experience. I’m not gonna be there, but Randy is, so there’s a real opportunity for us to draw from this experience. It’s great. It’s almost like you’re sending emissaries out into the world to have life experiences to draw from so that we can talk about it. We have two options, where one comedian only has one person. I took a football in the face today [Laughs.] because my son thought I threw a football in his face. That’s craziness. All that happened before Randy even woke up this morning. That was at 7:45 a.m. We’re leading different lives, and the cool thing about us having families and having different experiences through our children and our families is that stand-up is like this amazing respite from family life, and also, it’s like a joy to get up and do it together. Randy and I don’t live together, we don’t spend all our time together, we’re not sick of each other. When we come together and do stand-up, it’s really fun for us. And we can bring all these experiences that are frustrating or exciting or funny from our lives, that are different, together. I think that’s why we’re able to keep doing it together after two decades. AVC: Was there one guy who wanted to be a comedian who convinced the other one, or were you both on board immediately? RS: This is where the creepiness of twins comes into play that we can’t really explain. JS: I would say less the creepiness of twins and more your proclivities and the things that you gravitate toward. This is where our similar DNA probably had something to do with the fact that when we were kids and experiencing things the way we experienced them with our parents, they weren’t always like, “Okay, Jason, we’re gonna show you this movie and Randy, we’re gonna show you this movie.” No. They sat us both down and showed us Blazing Saddles. They sat us both down and showed us Airplane! We, together, were watching Jerry Seinfeld on the Young Comedians Special on HBO, or Rodney Dangerfield’s Young Comedians Special. Sets like that transformed us. We both would watch Letterman together. I have a daughter who’s 1 and a son who’s 6, and If he’s sitting down and watching a show on TV and if it’s not appropriate for her, I take her out of the room and she goes and does something else. Because we were at the same level of development, everything was appropriate or inappropriate equally to us. So we sort of came up with a shared set of experiences, and lucky for us, we were both interested in comedy. I guess as teenager at a time when there wasn’t such a thing as comedy nerdom, or if there was, it wasn’t as pronounced, we were comedy nerds. We knew every comedian. We also knew a ton about sports, but we knew people like touring road comic acts, like Kenny Rogerson. We’d know his bits and we would do them for people. JS: Kevin Meaney was a huge influence on us. I would say that most people don’t know who Kevin Meaney is, unless you’re a comedy fan, but he’s incredible, and he was such a huge influence on us. We knew his whole act. So when he came to perform one time, I just remember being in the front row, and we’d be basically saying his whole act as he was doing it, which he probably hated. RS: It was probably horrifying. JS: Horrifying and terrible for him. [Laughs.] But for us, it was like nirvana. We absolutely loved it. This was something we both were interested in and both shared that experience. I think as well, as twins back in the day, this was pre-fertility drugs, when twins were less of a regular occurrence. It was something special and unique, to be identical twins. You just immediately had this attention on you, this spotlight on you. So really early on, we said, “What are we gonna do with this attention on us? Do we just accept it and move on, or can we try and use it for something?” It all developed as this love of comedy. Let’s try and make people laugh. They’re already paying attention to us. Let’s have the thing that’s known about us be that we’re funny. AVC: So when you were first starting out, was the fact that you were identical twins a good selling point for getting yourself booked? Or was it harder because it was so atypical? RS: I think it was a great selling point, because you’re different and unique and not like everybody else coming up. It definitely got us seen. The problem was, we weren’t ready. It takes years to develop material that’s worthwhile. It really took us to get into the burgeoning alternative comedy scene in New York in the mid-’90s to realize that making sure that the reasons that you’re funny offstage equal the reasons that you’re funny onstage. What was happening in the late ’80s, early ’90s was that only the best of the best of the best were taking the ways that they were funny and putting them onstage. [Other] people were doing this weird approximation of what stand-up comedy should sound like, his or her cadence and all that stuff. So it was imitations of comedy as opposed to what was really funny. Then, alternative comedy rose up as a response to that, and that really opened the door for us. We want to be seen as funny, not just as twins. So that changed, and thankfully in the early part of our development, alternative comedy came along, and it was like, well, you can do whatever you want. JS: In fact, you’re rewarded for doing the most unexpected thing. So it drove us. We were motivated by what we were seeing. We saw Upright Citizens Brigade come to town and do just the most innovative stuff, like Luna Lounge, when they first came to New York, before they even had a theater, before they had anything. [With] Slovin & Allen, and Zach [Galifianakis], Sarah Silverman, Janeane [Garofalo], Louis [CK], and [Marc] Maron, and everybody in New York at that time—we were highly motivated to do something that was unique, unexpected, and would be respected. So we knew we couldn’t just go up and do twin stuff. That would be sort of super expected and seen as hacky. AVC: You’re a little bit like Jimmy Pardo in that the rhythms are kind of like vaudeville, but you’re bringing something new and unexpected at the same time. Was that something that you developed, or is that the way you talked back and forth naturally? RS: I think it’s the way we just talk. If you see us tell a story that’s not a comedic story, just something that happened to us in life, it starts to, in a vague sort of way, resemble the way we would tell a story onstage. I mean, we could have learned that from doing stand-up, but I think it’s the other way around. JS: First of all, huge compliment with Jimmy Pardo. We’re huge fans of his as a comedian and podcaster and a general entertainer. He is amazing. I think [we were influenced by] comedians like Andy Kindler, who in such a unique way would punch the joke, really hit the jokes hard, in sort of an old-school kind of way, and then twist it by commenting on what he just did. He was another comedian that Randy and I were just obsessed with. So maybe that has a little effect on it. Randy and I grew up in St. Louis, and our dad used to take us to work with him. He worked in an envelope company, not unlike Dunder Mifflin. It was essentially The Office. On the weekends he would have to go to work, and he would take us in, put us in a conference room. We’d watch cartoons and drink chocolate milk and draw. As we drove down to his office, there was a show in St. Louis hosted by Jack Carney. They played all the old comedy bits that were safe to play on the radio, from the ’50s, ’60s, and ’70s. I think we were drawn to the cadence and the styles. It’s different from what we ultimately ended up with, but the back and forth between Abbott & Costello, that flow between those two people, and the hitting of the jokes, and the back and forth, and almost how they blended into one voice—I think we’ve incorporated that, either knowingly or subconsciously, into our act. RS: Without trying to. Our goal wasn’t to copy that. JS: No, I think we were influenced by it. We also realized that we have a skill for that. We have a good ability to listen to each other onstage. Half of being able to not crosstalk and hurt each other’s jokes, a lot of that is listening, just listening while you’re talking and feeling the other person wanting to move forward and start talking. If you feel it, you just kind of back down and give the other person space, so it’s listening and trusting your partner. AVC: In a way, you’re doing the improv rules of listening and agreement to the extreme. RS: Yeah. We have a couple bits where we leave it open. Jay did Curb Your Enthusiasm, and it’s similar to the way that show is done. You know the beginning and you know the end. How you get there might be different on every take. For us, it keeps us fresh. I remember we used to do a bit, two albums ago, about the idea of Snow White, reading fairy tales to your kids. They’re really poorly done. Everything just wraps up really quickly. We have to teach our kids more than just, everything gets wrapped up easily. JS: “They live happily ever after” is kind of the bow they put on it. But we’re like, “Wait, the way that Prince Charming met Snow White is that he saw that she was dead, and he started kissing her…” As we’re starting to realize it, what if eight months from now, she just realized that she is now spending the rest of her life with a necrophiliac? So we then play out a scene onstage where she’s making that realization and he’s trying to deflect it. RS: It really becomes a marriage conversation, and that’s where Jay and I can play both characters. I played Snow White and Jay played Prince Charming. He kind of knows what’s coming, and she’s making breakfast, and she wants to bring up something in the way that you bring up something when you’re newly married but you don’t have the pathways to communicate the way you would when you’re 10 years into it. So it’s all of that stuff. We would leave that pretty open. My goal was to get him to listen to me, and he wants to talk about making breakfast and all this other stuff. So the push and pull of that was very real. We left it wide open. JS: He also has been waiting for this conversation to come, so he’s doing everything he can to deflect and change the subject. So once we have those acting motivations and we have that improv in place a little bit, it was different every time. It was different when we recorded the album than the night before we recorded it. That for us was super exciting onstage and was really fun and we feel like that’s where we can go, where other comedians can’t go. We’re a little mini troupe up there. That for us is super exciting. RS: There’s a current bit we’re doing right now about our second cousin who’s a writer, who lives in Austin, she came to see us at the Moontower Comedy Festival last year. She’s like, “I have some notes for your act.” She’s not a comedian. She actually knows a ton about comedy and she’s gotten really into it. “I have some notes.” The second you hear that—we’ve been doing comedy for 25 years. [Laughs.] We know we have to improve on certain things, and there are things we’re trying to get better at, but to take notes from someone who is not a comedian… Part of me was like, I don’t want to hear these. But then part of me was like, I really want to hear these, because maybe something funny can come out of her notes. [Laughs.] And she said to us, “You guys agree too much onstage. Where’s the conflict?” She kind of hearkened back to other things—the Smothers Brothers and this and that. My inclination was to say, “We don’t want to be them. We don’t want to recreate them.” We can’t. It’s not truthful to who we are. They already did it, number one, so we don’t want to repeat what other people are doing. Number two, we probably wouldn’t do it as well as they did it—they’re amazing. You’ve got to give credit where credit is due. Thirdly, we want to create our own thing. But truthfully, I thought to myself, “What if she’s right?” What if that’s what’s holding us back from being as big as we can possibly be? Who knows what’s possible for us. We don’t. It’s nice to think that there are still things possible for us. RS: We’ve really legitimately been doing stand-up since ’94, ’95. And I still think there’s stuff that we need to learn and places we can go with this. People ask us, “When are you going to be done doing it together?” and our response is, quite simply, as soon as we are sick of doing it, as soon as we feel like there’s nothing left to do. Luckily for us we’re not good enough to figure out all there is to do yet. JS: Yeah, for us, we still feel like we have a lot of room to grow. We’re still figuring it out. Figuring out our voice, figuring out what we can contribute. We’re proud of stuff we’ve done, but we think there’s a lot more we can do.